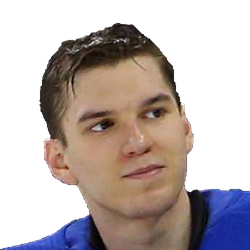 Alexandar Georgiev followed up the best game of his young career by making 31 saves, and Vladislav Namestnikov scored two of New York's three goals in the final 3:53 as the Rangers defeated the host Buffalo Sabres 6-2 on Friday night. Georgiev made a point-blank stop on Rasmus Dahlin during a power-play in the opening minute, another point-blank save on Jack Eichel and a point-blank stop on Tage Thompson with about 11 minutes remaining. With about 4 1/2 minutes left, he made a point-blank stop on Conor Sheary. Shortly after stopping Sheary, the Rangers padded their one-goal lead when Pavel Buchnevich and Namestnikov tallied eight seconds apart to push the lead to 5-2. Namestnikov then sealed the win by scoring into an empty net with 58 seconds remaining. Jimmy Vesey put the Rangers ahead 3-1 early in the second period, while Boo Nieves and Jesper Fast tallied in the first period. Jeff Skinner scored twice for Buffalo, which was unable to win consecutive games for the first time since Dec. 11-13. It was Skinner's eighth multi-goal game of the season and upped his total to 36, three behind Washington's Alexander Ovechkin for the league lead. 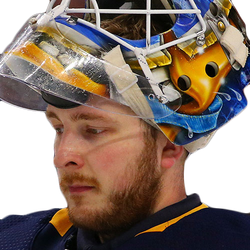 Buffalo backup goaltender Linus Ullmark allowed at least five goals for the sixth time this season, while facing 28 shots. The Rangers opened the scoring with 15:51 remaining in the first period when defenseman Brendan Smith, who was playing as a forward, kept alive a loose puck with a lunge and fed the puck to Nieves in the high slot. Nieves finished the play with a wrist shot over Ullmark. New York made it 2-0 nearly 10 minutes later when Fast deflected Namestnikov's slap shot from the right point over Ullmark's stick. Buffalo got on the board at 2-1 when Skinner had plenty of time to put a wrist shot over Georgiev following a turnover by Rangers defenseman Neal Pionk behind the net, 53 seconds into the second period. New York made it 3-1 as the referees signaled a penalty when Buchnevich made a one-handed pass from behind the net to Vesey, who shoveled the puck into the net from the doorstep 58 seconds later. After doing little offensively most of the second, Skinner made it a one-goal game with a one-timer from the high slot over Georgiev's glove with 3:04 left in the second.